Club Penguin Cheats by Mimo777 Club Penguin Cheats by Mimo777: Club Penguin Player Card Update! Dude, have you clicked on anyones player card today? All their clothes an backgrounds slowly appear. i know one time i clicked and the penguin was not there not evan the backgouned and i think it was a glich for me thou. I saw it earlier, I was like confused, I thought it was my slow computer... haha! Yep! I noticed! It's really cool! I especially like it because it starts dark and gets brighter... i dont know, its just so... whats the word... awe-some! i just checked it out! to is so cool! I just figured that out lol. i dont get how it is changing! It happens when you dance and change clothes at the same time. Wow! That's kind of weird. I have to go check it out! OMG, I just went to test it and it's awesome! u have more coins than me(crickets noise) awkward. i no i got kinda creeped out and thought it was a glitch. turns out not. also when ppl dance there bodies move differently than their clothes. 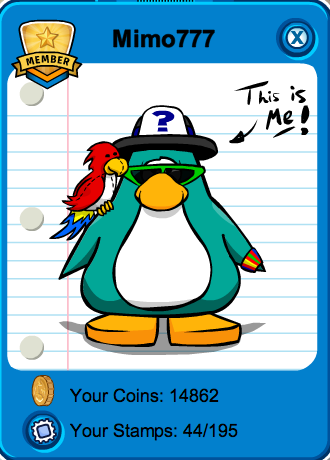 At first the clothes and background on your penguin are not there, but fade in slowly. Is that what you meant? P.S. I think that's what you do when you want to become a mod, but somebody please tell me if it isn't. Whats with the picture? It's pointless because it shows the player card picture perfect. This is my first time on your site, Mimo! it must have something to do with Halloween.Also other people have posted that.have you seen the glitch that when you where gogles and you dance the goggles dance after the penguin.